Sleep deprivation and insulin resistance could be connected. Our body processes such as appetite control, weight control and immune system work seamlessly when we get enough sleep, as this helps those hormones that regulate these processes. People who do not sleep well are more tired during the day and turn to food for comfort, often leading to an increase in weight. 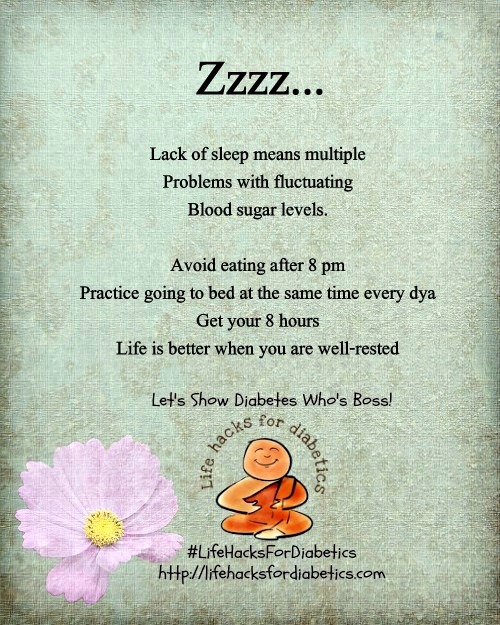 Since good diabetes control is a direct outcome of a healthy diet, exercise and weight management, make sure you get enough zzzz. Include regular exercise into your daily routine and practice sticking to a regular bed time. Thank you for all of these great suggestions, and congratulations on completing the #AtoZChallenge! Congratulations on completing the a-z challenge. Sorry for the generic comment but I don’t really know enough about diabetes to have a useful comment!